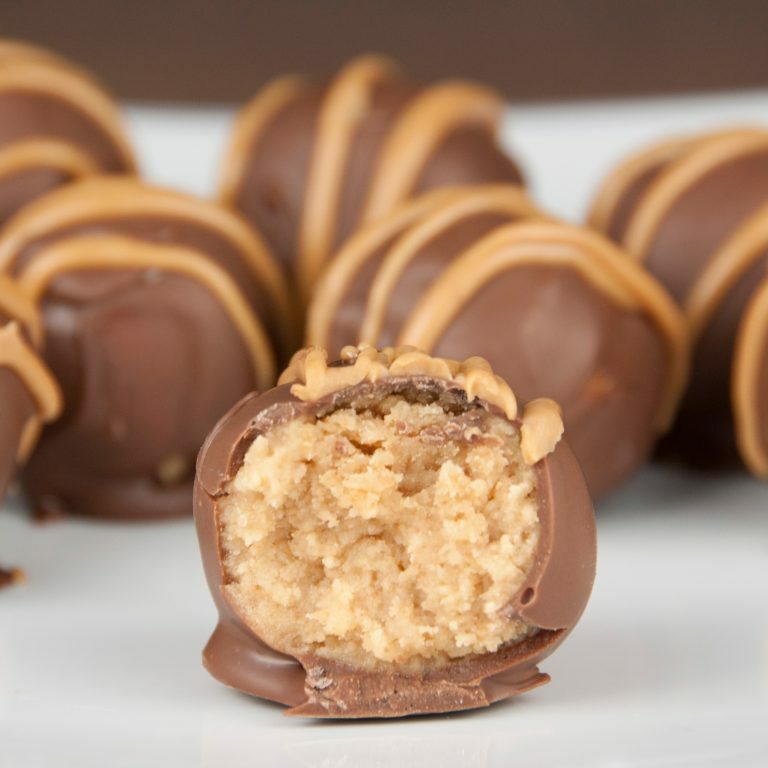 Nutter Butter truffles dessert recipe (also known as “cookie balls”) are covered in milk chocolate and finished off with a drizzle of melted peanut butter on top. Do you remember a couple of months back when I did an entire week of all childhood favorite foods of mine? 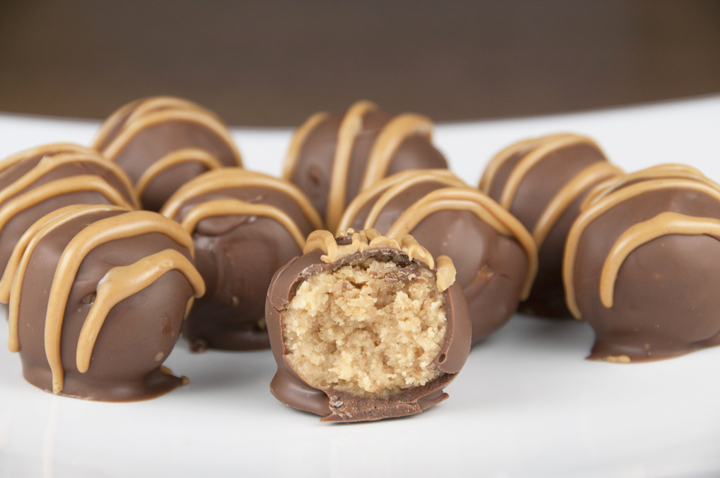 Well, I feel like I’m unofficially doing a repeat of that week with my Fudge Stripe Cookie Cupcakes, chicken noodle soup recipe, the Margherita macaroni and cheese recipe and now these nutter butter truffles made with one of my favorite childhood cookies. I guess I’m just feeling nostalgic in 2014. Nutter Butter cookie truffles dessert recipe (or cookie balls) covered in milk chocolate and finished off with a drizzle of melted peanut butter on top. Crush nutter butters in food processor. Cut up softened cream cheese into chunks and add to food processor. Pulse until combined into a dough. Roll into small balls (about 1 inch). Freeze for 10 minutes on a cookie sheet. Melt chocolate discs in the microwave on low (50%) power setting, to avoid scorching or burning it. If your microwave does not have this option, heat the chocolate in shorter intervals and stir between each bout of heat. Stir until smooth and all chocolate is melted. Using a toothpick or spoon, dip the nutter butter balls into the chocolate, letting the excess chocolate drip off. Melt more chocolate, as needed. Set the truffles on waxed paper to cool. Microwave some peanut butter (you don’t need too much). 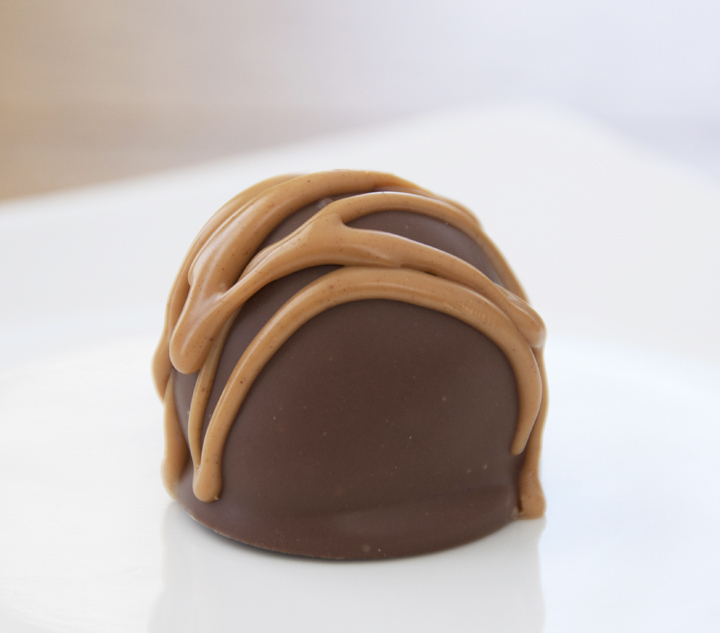 Use a spoon or fork to drizzle the peanut butter on top of the truffles. Store in the refrigerator 1 hour or until firm. Keep refrigerated. Note: another way to easily coat balls with the melted chocolate, add balls in batches to bowl of melted chocolate. Use 2 forks to roll balls in chocolate until evenly coated. Remove balls with forks, letting excess chocolate drip back into bowl. Aren’t they just the best?! Good golly Ashley – these look totally delicious!!! Peanut butter and chocolate are my fav combo – seeing them like this – first thing in the morning – gosh – I just wish I could reach into my computer and grab me that big chocolatey delight! This is genius! I have a nutter butter obsessed friend that would die over these!!! Going to make this weekend! They are awesome!! Thanks, Kelly!! Wow, these look good! I think I would prefer these over oreo balls even! I don’t think I’d be able to choose!! 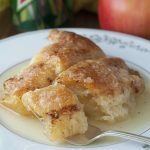 This is a great dessert to make if you want some new best friends! Looks awesome, Ashley! I agree! LOL Thanks Eva! Ashley, I’ve never made a truffle before. I always thought it was too hard or complex. 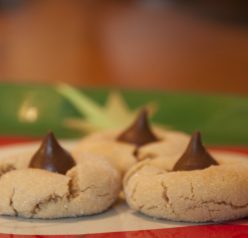 Your recipe sounds so easy that I have to try these. 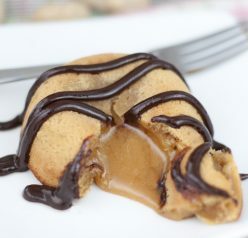 I am obsessed with the peanut butter chocolate combination! Yum! Oh my!! You should definitely try them! They are super easy! Oh wow. These look absolutely NOT on my diet. haha YUM! YES. A THOUSAND TIMES YES!!!!!!!!!!!!! What a gorgeous idea for truffles! Yum, these sound and look amazing! Now that they have reduced some of the packages to a smaller version could you tell me how many ounces in a pkg of nutter butter cookies. Or about how many cookies does this recipe take?????? I believe the package is 16 oz. Hope that helps! Like the melting discs. Any melting chocolate or almond bark or chocolate chips is fine.